The mountain bike mania continues here at watermanatwork.com. The salmon have arrived, but so has the wind, so we are getting out on the trails every chance we get. There’s no shortage of places to go and we are always ready for a new mountain bike adventure. 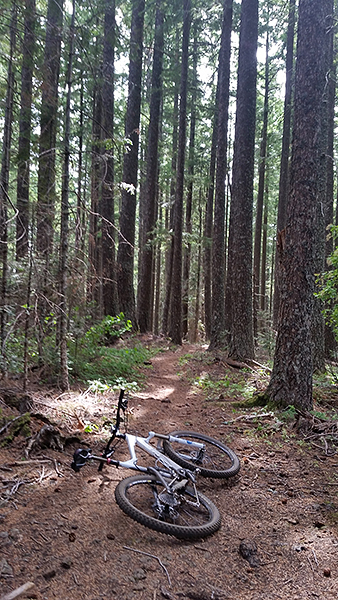 We go further and further out into the forest every time we go riding. It’s a great day of riding just looking around and exploring new places. This is an old logging operation. 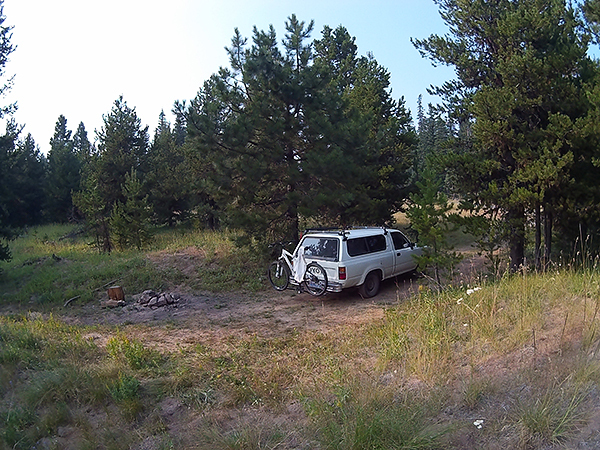 This spot is were they would load the logs onto logging trucks for the long ride out of the woods. 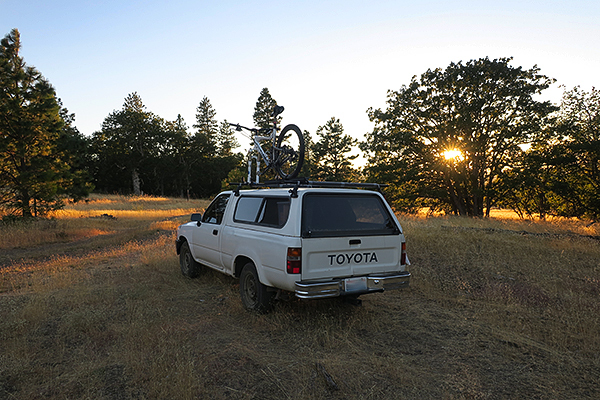 There are a lot of roads and trails that get very little use that are great for exploring. 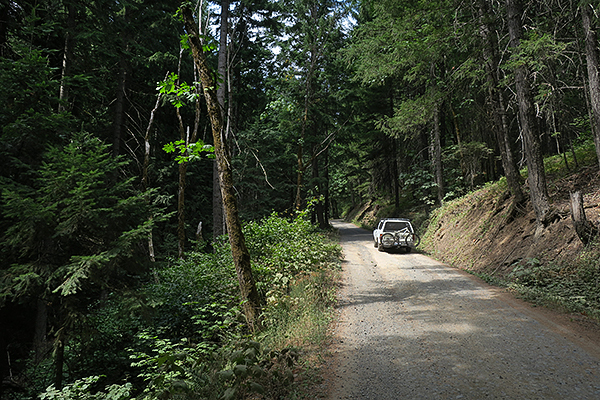 Here’s an old logging road that leads to who knows where? We’ll probably check it out the next time we are here. Some of the trails get very little use, maybe only a handful of intrepid explorers every year, probably a few hunters. 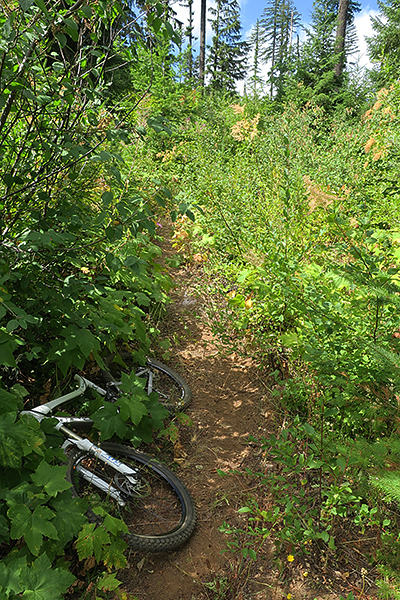 You have to be careful riding this kind of trail because it’s so overgrown that it’s hard to see what’s ahead of you. You can come across a bunch of deer or a bear on the trail, too. 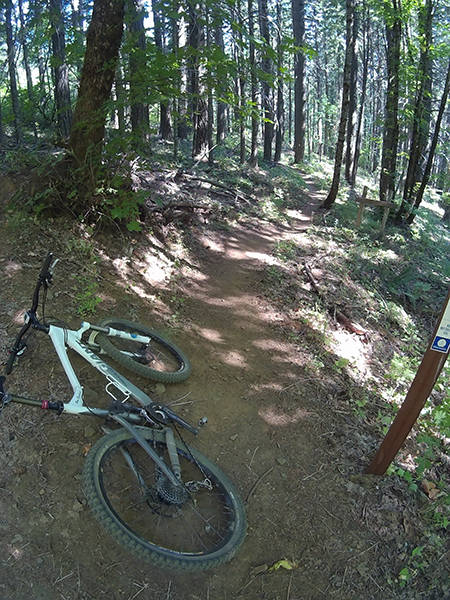 With overcrowded popular trails just a few miles away, there are trails like this dying from not enough use. As we mentioned, the salmon are here and our kayaks are packed and ready to fish. Only problem is that it is very windy so that puts a damper on the kayak salmon fishing. It is also Labor Day Weekend and it is going to be hot, real hot, like in the hundreds. To escape the heat, wind and crowds, we are headed back to the mountains for more mountain bike riding. We’ll be back after the holiday weekend to get the salmon fishing started! We spent another weekend off in the woods mountain biking. We are getting in as much mountain bike riding in as possible because we are probably going to spend most of our time salmon fishing starting in a few days. The days are also getting shorter and it’s starting to get cool at night, so that means winter is right around the corner. The seasons change quickly around here, gotta squeeze everything you can out of those summer days. 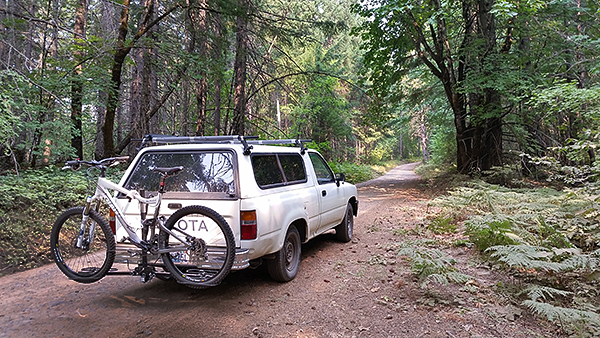 We put in a lot of miles riding on Forest Service and logging roads. There are literally thousands of miles of roads like this across the Pacific Northwest. While weekend riders crowd the “name brand” mountain bike trails, you can ride roads like this all day long and hardly ever come across another human being. 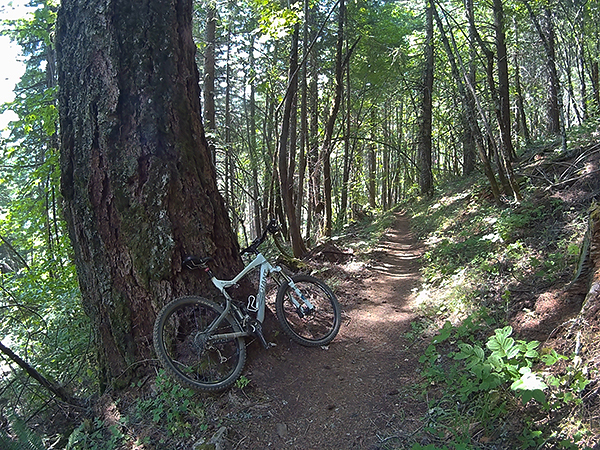 Of course there are plenty of singletrack trails to ride as well. 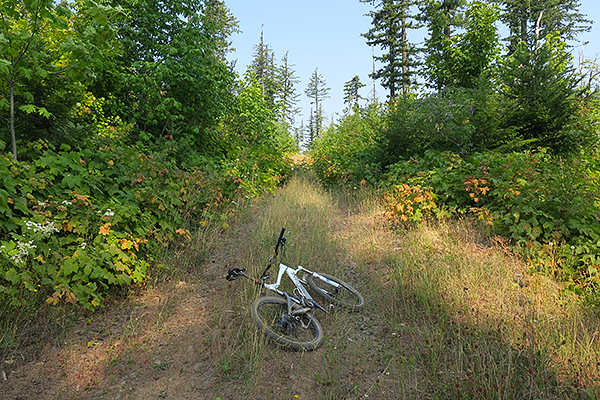 This late in a dry summer, many of the trails are dusty and “blown out” from riders skidding around the corners so you have to go deeper into the woods to find the trails that are not as popular or well known. 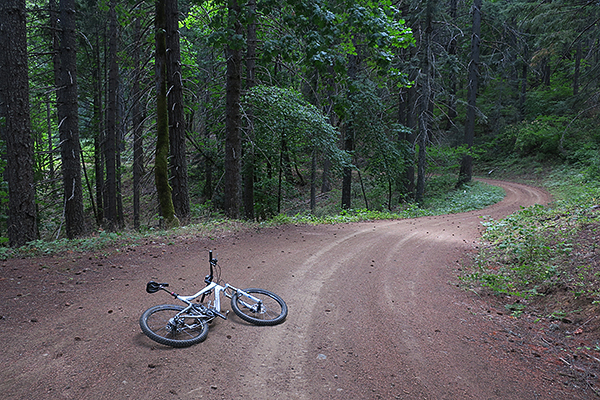 We swung down into Central Oregon for a bit of riding there, but the long dry spell has got everything crusty dry and dusty. Still fun, just a bit dusty. As we mentioned, the days are getting shorter, so that means it’s almost time for salmon fishing season. If the conditions are favorable, we will probably get out on the Columbia River and try for the first salmon of the season. This early in the salmon run, odds of catching a fish are pretty slim, but the weather is nice so why not give it a try? Keep checking back because there’s a lot going on this time of year and we’ve got some exciting things planned for the next couple months. One of our potato cams was acting up yesterday so we were not able to post some of the mountain biking photos from our most recent adventures, so here’s a few additional photos. We will be so happy when the new camera comes in, hopefully tomorrow. Stay tuned for more cycling photos. We may even get out there fishing again if the fish decide to start biting again. We’re in a pretty good spot to see the solar eclipse this Monday so we will probably be adding to the millions of Eclipse 2017 photos on the internet as well. 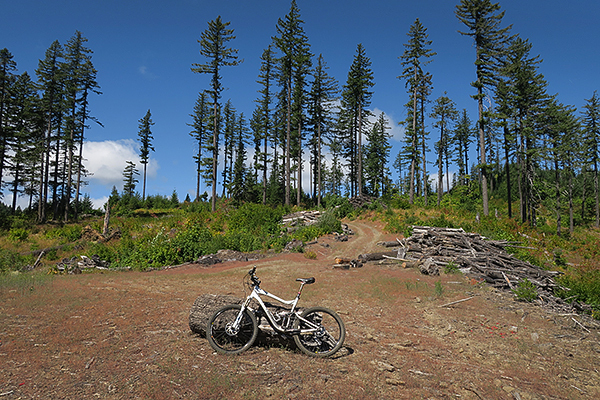 It’s been mostly hot and windy, the fishing is terrible so why not head off for some mountain biking in the Cascade Mountains? 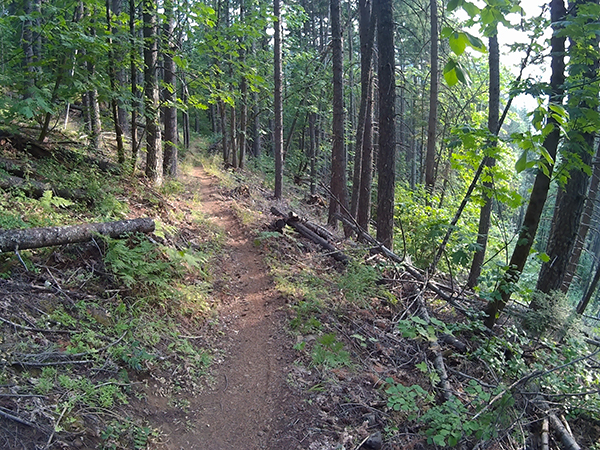 We’ve been having a great time lately packing up the bikes and heading into the mountains, getting back into that great feeling of flying down PacNW singletrack. We checked out the “brand name” trails in the Mt. 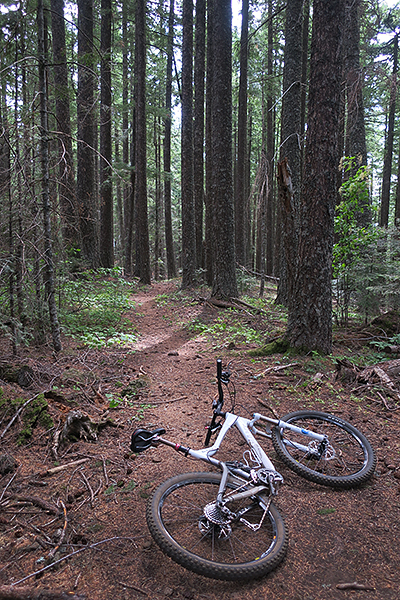 Hood National Forest, but the trails were dry, dusty and mostly blown out from all the use. Some of the trails in this area have gotten too famous for their own good and the increased rider traffic has taken it’s toll. There were a lot of vehicles roaming around so we decided to try our luck across the Columbia River in Washington, which turned out to be a good move. The trails there, not nearly as well known, were in much better condition. 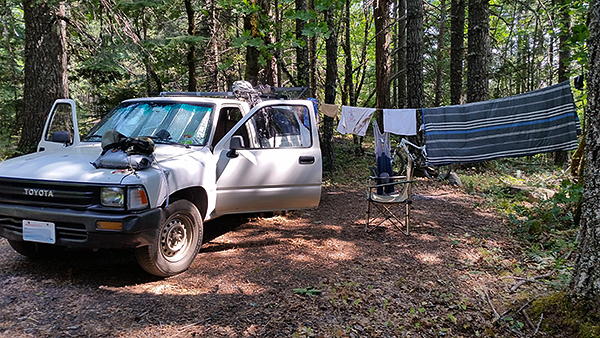 We camped out at a primitive camping area. Most of the camping is pretty primitive in these parts, which we don’t mind, but you must bring everything you need with you. 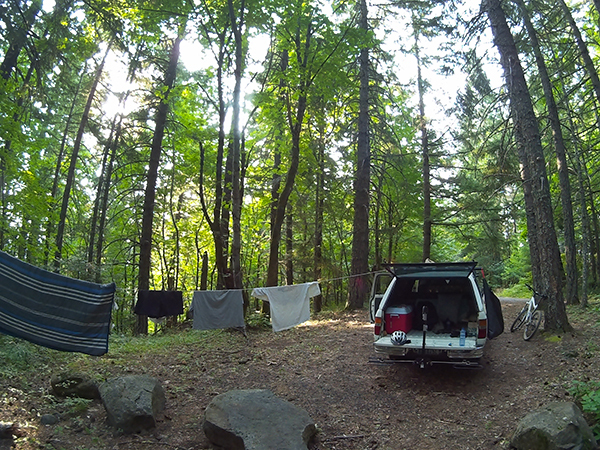 This is known as “dry camping” because there are no facilities like running water or toilets. This kind of camping is something we do all the time, so we know what to take and what to leave at home. 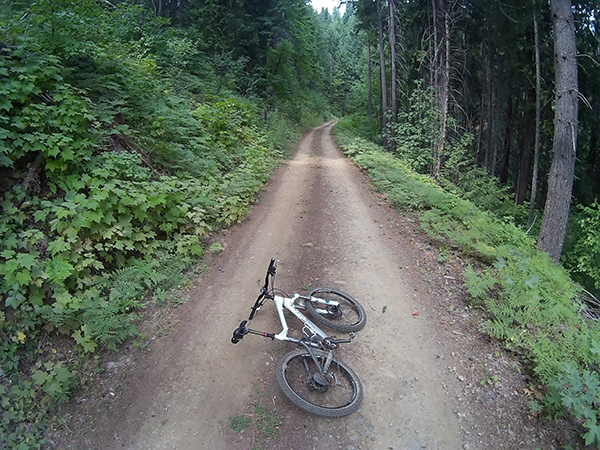 The trails around here are really great. Hardly any other riders, local people mostly, and the trails remain in pretty good shape because the local riders have a tendency to not destroy the trails in their neck of the woods. This is rugged, mountainous country so you have to be prepared for anything. If you are willing to venture off the beaten path, you’ll find plenty of places like this. These are the Cascade Mountains and there is plenty of climbing to go along with the great downhills. We are working into mountain biking shape and are starting to be able to climb to the tops of some of the local peaks. 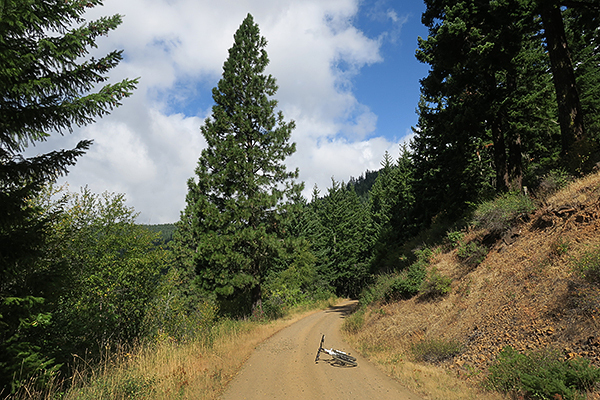 The climb up to this peak is a brutally steep haul up rough Forest Service roads. It’s a great view from the top and a really killer downhill as payback for the hard climbing required to get up here. We’re in town for a few days to take care of business, then we’ll be off on another road trip. We’d like to get some fishing in, but the smallmouth bass fishing is not that good, salmon season will be getting under way in a couple weeks, so we might just wait for the big fish and continue our fun mountain biking adventures. We’ve also been scraping by with some pretty crappy camera gear. We’ve been using Panasonic Lumix cameras for a few years, but they only seem to last about two years. These are not cheap point and shoot cameras, they cost nearly $400. That’s a little bit too much to pay for a camera that only lasts a couple years, so we are back to camera brands we’ve trusted for years and are awaiting the delivery of a new Canon PowerShot G9X, so you can expect the run of somewhat below standard photo quality to come to an end. Stay tuned. 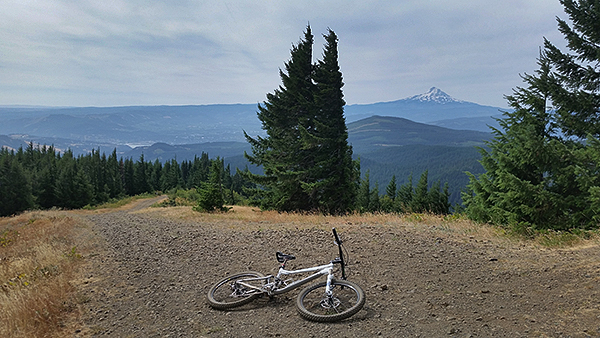 As I mentioned yesterday, after a long time away from the off road cycling, we spent a few days deep in the mountains of southwest Washington state getting back to the mountain bike basics. Just the bike, a cooler full of beer and food and enough water to last a few days in the more remote foothills of the Cascade Mountains. 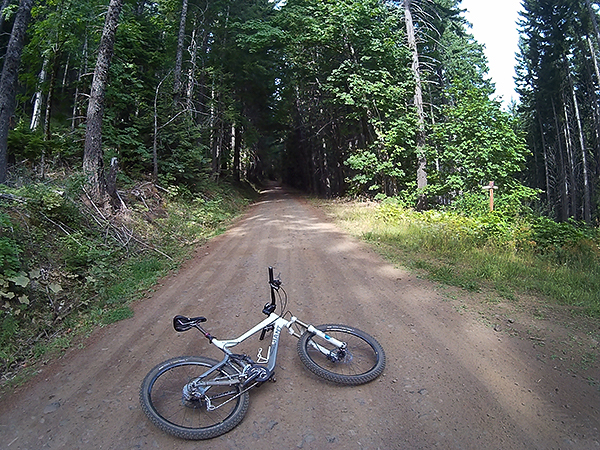 Nothing fancy, just a lot of singletrack and wide open forest service roads. We got started as early as we could, usually about 7:30 AM to beat the record heat that would come later in the day. The midday temperatures were over 100°F every day and the air was full of smoke from western wildfires. We could ride until about 1:00 PM when it just got too hot. 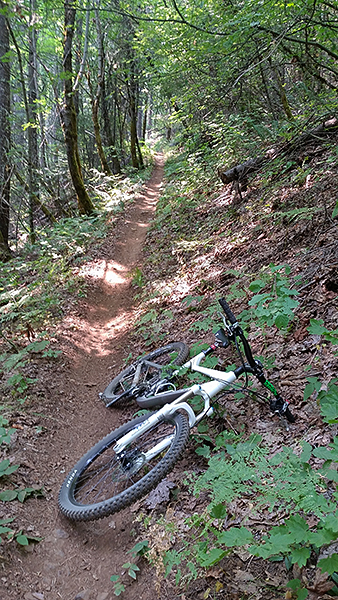 By then, we’d ridden more than five hours of challenging terrain in the Cascade Mountain foothills, so we could kick back and have a couple beers to get through the afternoon swelter. Even with more than a month without rain, we were far enough off the beaten path so the singletrack trails were dry, but not too dusty and blown out. 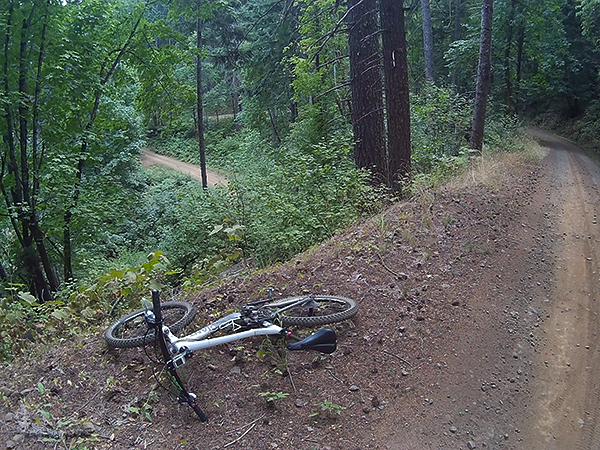 Didn’t take long to get back to the reason we ride mountain bikes out in the woods. 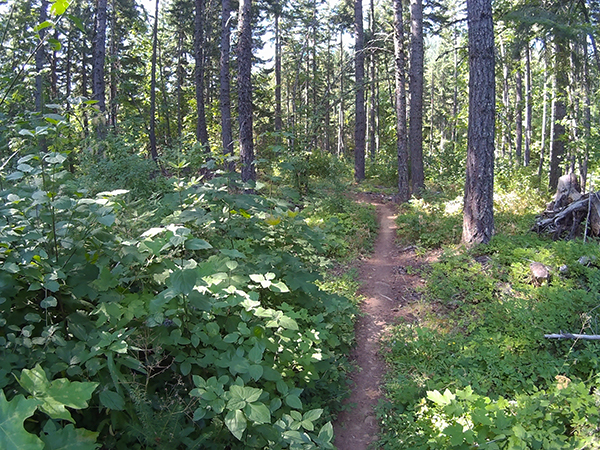 The singletrack trails are all connected by Forest Service roads. The singletrack riding is the most fun, but the miles of riding on the Forest Service roads really help to build fitness. It’s like riding a road bike, but only on dirt. 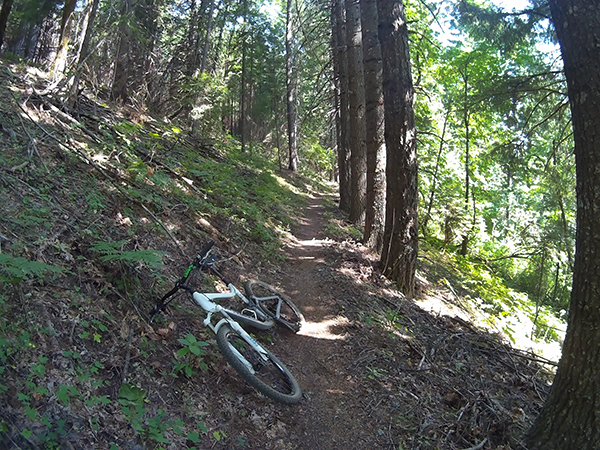 We couldn’t get enough of the singletrack riding, especially after not having ridden for some time. 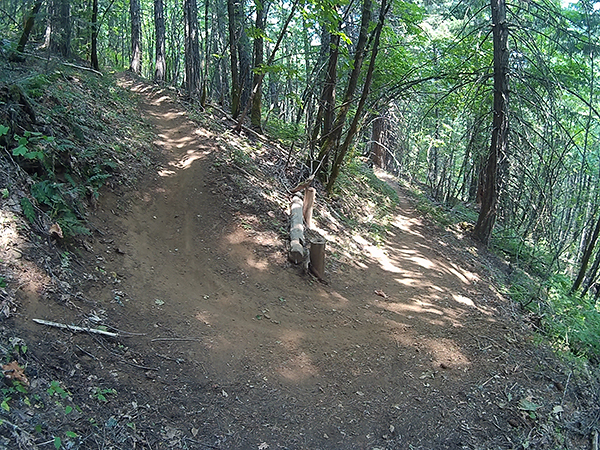 Never can have too much singletrack if you’re a mountain biker. So, we are stoked again to go bike riding, especially since the fishing seems to be especially poor. Stay tuned, because there is another cycling adventure coming up shortly. 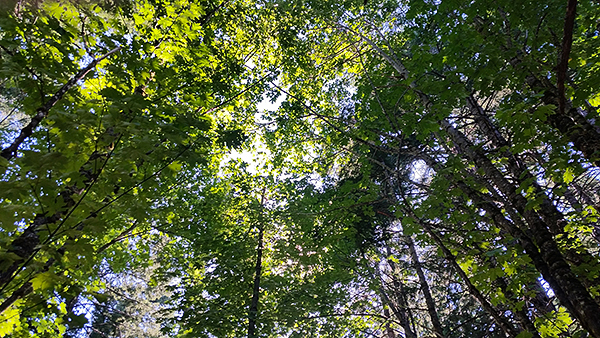 We spent a long, somewhat hot extended weekend mountain biking excellent singletrack trails and forest service roads in southwest Washington. This area is well off the beaten path and it was pure enjoyment to be out on the trail without crowds of people. We’re back in civilization stocking up on supplies before we head back out into the woods and we will try to have a few more photos and story about the two wheeled weekend in the hills. Stay tuned for more tomorrow! I rode my bike until I came to the end of the road. 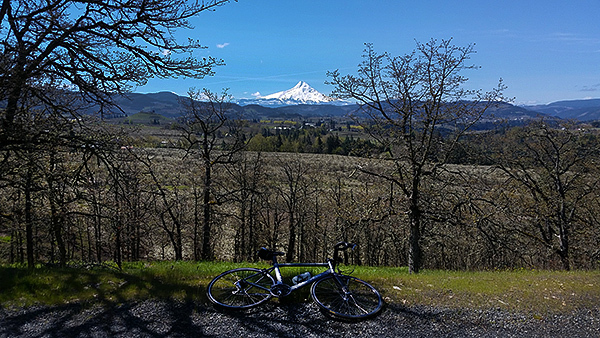 It was a beautiful spring day today, perfect for a bike ride around Hood River, Oregon. 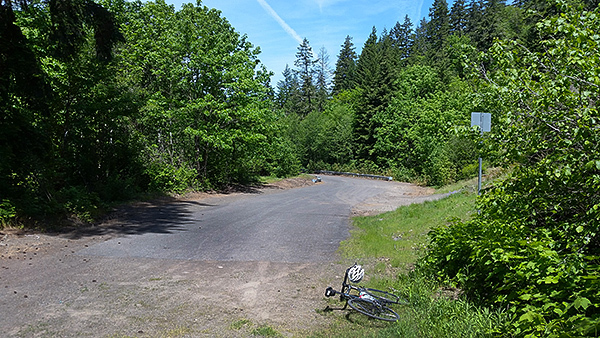 This area is undoubtedly one of the best places in the United States to ride bikes. 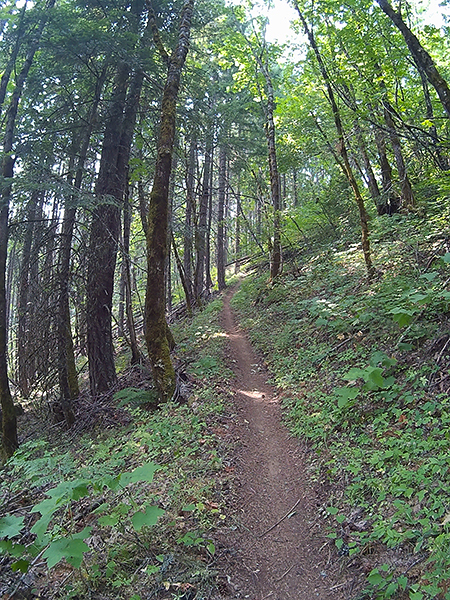 Riding on the road through the valleys and mountains of the Columbia Gorge or on one of the many trails on a mountain bike, it’s pretty hard to beat. We are lucky enough to be able to ride here all the time, something we are very thankful for. The spring pear blossom bloom is pretty much over. Some of the apple trees are still blooming. Lots of bees flying around. The mountain biking is great, but we are on a short and quick fitness program, so you get more workout bang for your buck on the road bike. For the next couple weeks, if we aren’t kayak fishing, we will be bike riding. Looks like decent weather as well so we are looking forward to every day. 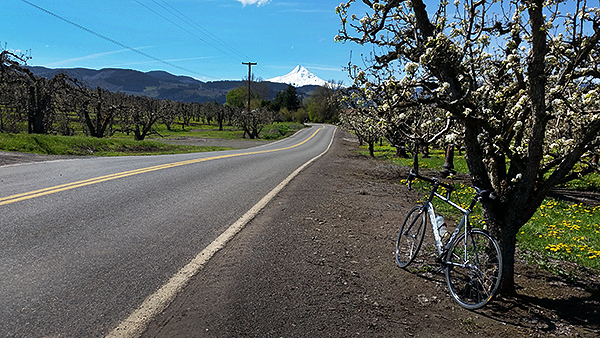 We went for a great spring bike ride a couple days ago around the Columbia River Gorge and posted a couple photos from the ride. It was a great day for a bike ride. It was such a nice day, I took a few photos before we went riding with a different camera. When it’s really nice, you are thankful for your good fortune and take it all in. There are a lot of nice places in the world. Some places are nicer than others, but almost every place has that one perfect day out of the other barely manageable days that keeps you hanging on. Take advantage of that perfect day and get what you can from the rest of it. 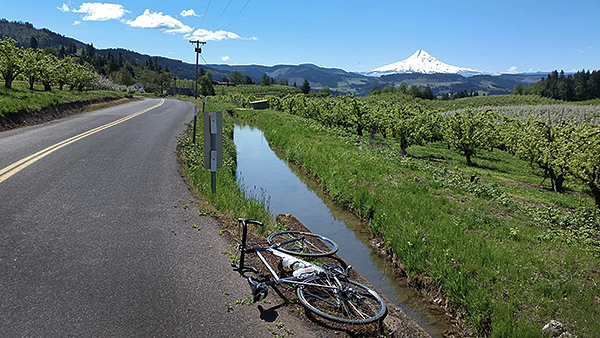 The off and on spring rain stayed “off” today and provided for a great spring bike ride in the Columbia River Gorge. It’s finally starting to feel a little bit like spring, but there are still plenty of rain showers and clouds to go around. When you get a nice day around here, you take advantage of it. 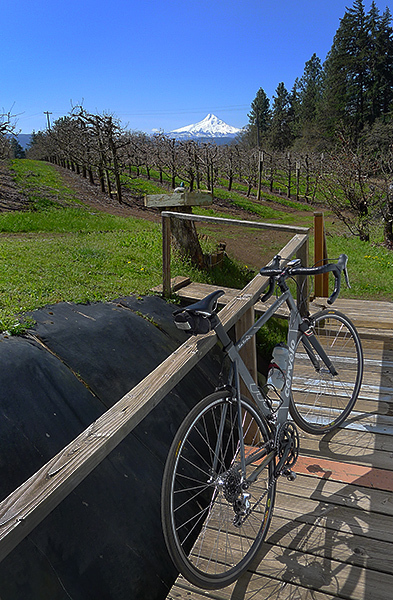 It’s a nice time of year for cycling in the Gorge if you read the weather correctly and dodge a few showers. The pear tree blossoms are blooming in the Hood River valley and this weekend is The Dalles Cherry Festival, so it’s a big spring weekend. 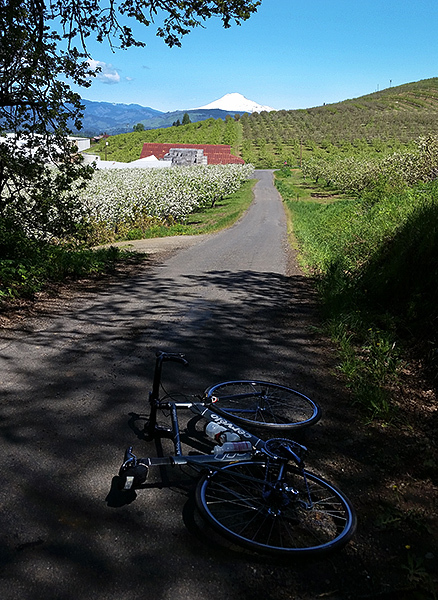 There are going to be a lot of people checking out the blossoms, so be careful if you’re driving, or especially if you’re riding a bicycle around the Columbia River Gorge. We got the kayaks and kayak gear out and will be getting ready for the fishing season’s first trip. The weather and wind are uncertain for the next few days, so we will be getting the gear ready to go for the first available fishing day.